We have yet to spend much time in central Japan due to the high cost of transportation and accommodation but we have spent some time in most of the major places. When we first arrived to Japan, the JET Programme put us up in a gorgeous hotel in Shinjuku, the most modern, vibrant district in Tokyo. It was a little surreal. First of all, travelling all this way to Japan, and then being placed in a hotel with 2,000 other fresh, foreigners all excited about being here. It was like frosh week at university, just that we were in Tokyo and all of us had money to burn. I think Shinjuku was a little thrown off by our presence too. It is the busiest place in the world, but generally it's just hordes of Japanese businessmen in suits in the day, and alternative Japanese youth at night. With 99.4% of the population in Japan being Japanese, I think the presence of 2,000 young foreigners from the States, UK, Canada, Australia, New Zealand, etc... kinda threw people off. I doubt I'll ever see that many foreign faces in Japan all together ever again. In February 2003, Eden had a friend from home visit. So we decided to all go to Kyoto for three days. Kyoto is really the cultural heart of Japan, and the people there speak their own dialect, Kansai-ben. While Kansai-ben is thought to be more elegant than standard Japanese, or Tokyo-ben, we have been warned not to use Kumamoto-ben or Kumamoto dialect when we travel outside of Kumamoto because people will not understand us, and others will laugh at us. Despite this, Kumamoto dialect is still fun to learn, and people love to hear you speak it. The other thing is if you come to Kumamoto and don't recognize Kumamoto-ben, you may have no idea what people are talking about. But, I still think it would be easier to learn Japanese if we lived closer to Tokyo or our textbooks were written in Kumamoto-ben and not standard Japanese. So, Kyoto was a lot of fun and a must see if you come to Japan. It can get a little tiresome at times because there are SO many temples, but just pick and choose which ones you want to see, you don't have to see them all. After that, try exploring down the small side streets. If you wonder around in the early evening it is possible to see a geisha, but I think it's highly improbable. Geisha exist, but I think you'd have to camp outside their shops if you ever want to see one. 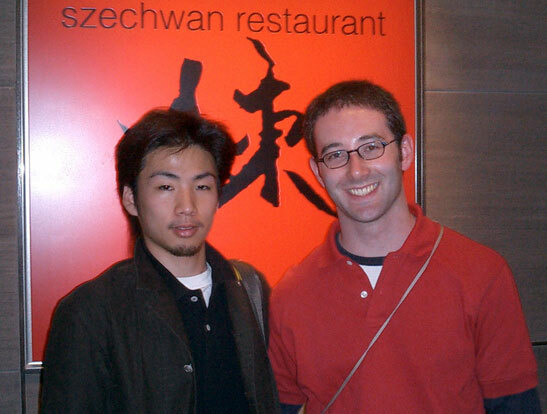 In May 2003, Eden and I went to Kobe for the renewer's conference. Every year the JETs who decide to renew their contracts get to go to Kobe for a conference. While there are a lot of workshops and stuff, the conference is a great way to see the Kobe region for free. Eden and I decided to head up to Kobe a couple days early and take in Osaka as well. Osaka is a pretty vibrant place, but after living in Japan for nearly a year, all the cities really start to feel the same. So we decided to check out Osaka castle, and then we headed off to the aquarium. The aquarium was really interesting and had this gigantic tank with sharks, rays, and a massive whale shark. If you have never seen a whale shark, it is the largest fish in the world and is quite amazing. It isn't like other sharks because it filters plankton, but it does have gills which makes it a fish. On the trip from Osaka to Kobe, we decided to go a little out of the way and visit Himeji castle. It is supposed to be the best castle in Japan because of it's size and layout, but mainly because it is an original. After Himeji, we went back to Kobe for the conference. Kobe is a pretty neat city, but I think it would appeal more to the foreigner who has lived in Japan for a while than a short term visitor. In Kobe we were astonished to find that they have an Old Spaghetti Factory, although we never did manage to make it out there.